The LEVR is a firefighter escape system that can be used by firefighters should they become caught or trapped on an upper floor in untenable conditions. The LEVR has been designed for quick and easy deployment, as well as smooth horizontal movement for fast egress. It is a low profile and lightweight escape system, mainly due to the inclusion of 50-feet of 11mm Fire Escape Web (FR webbing). 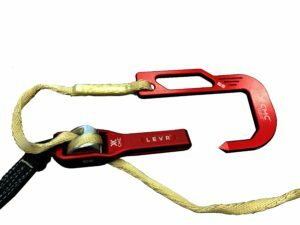 In addition to the LEVR descender and the Fire Escape Web line, the system also includes the CMC FlashLite Anchor Hook, Nomex carry bag and ProTech Aluminum Auto-Lock Carabiner with Kevlar tether. This system is UL certified to NFPA 1983 standards. The CMC LEVR bailout system can be purchased from All Hands Fire Equipment. Quantity discounts are available. CMC LEVR Escape System Basic End User Training and Train-the-Trainer programs are also available.